Our road trip is in a couple of days and I'm so excited! For the last few days I've been getting everything ready for our trip and mapping out the destinations, rest stops and restaurants we will be visiting. I wanted an easy way to keep track of everything and Yahoo Travel has been a great help in doing so. 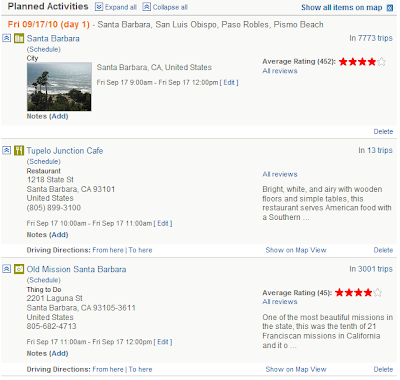 Yahoo provides a whole site dedicated to travel, you can research, plan and even book your trip on their site! 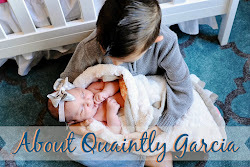 For our road trip I used their free Trip Planner and mapped out our whole trip in less than 1 hour, including budget and kid friendly restaurants with great reviews and must see locations in every city. 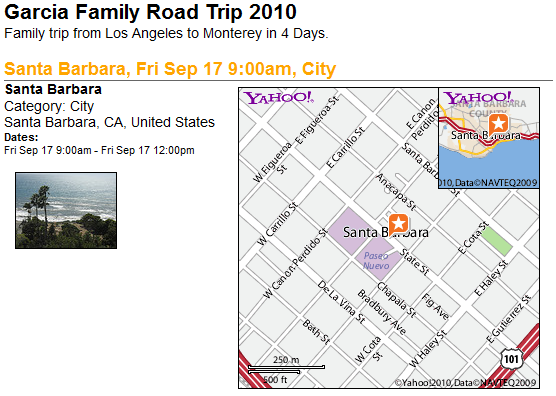 Yahoo even allows you to share your trip via Twitter, Facebook, Myspace, etc., send your itinerary to your phone or email it. The email feature definitely came in handy, I emailed our trip itinerary to my hubby and he was able to add and make changes to the trip also! Here is a little sneak peak of day 1 of our trip. I'm jealous! My road trip was to San Diego and back...but we did the coastal trip a couple of years ago and it was wonderful. Have a great trip and take lots of pictures. Oh, and When you get back, I'll be getting ready to post Cooper's party! Thank you, I will take lots of pics! I can't wait to see Cooper's Party, I'm so excited for him, he's gonna have so much fun!